KM Coating offers quality high pressure spray tips for your airless paint sprayer or air assisted airless sprayer. Whether you require flat airless spray tips, reversible paint sprayer tips or air assisted airless spray tips in either standard or fine finish versions you can find the right item to get the job done. By understanding the science of fluid mechanics our R&D department has been able to ensure the optimum design and construction of our tungsten carbide high pressure spray nozzles. Only the finest quality materials are used, which provides maximum erosion resistance for high pressure spraying allowing us to outlast others currently on the market. 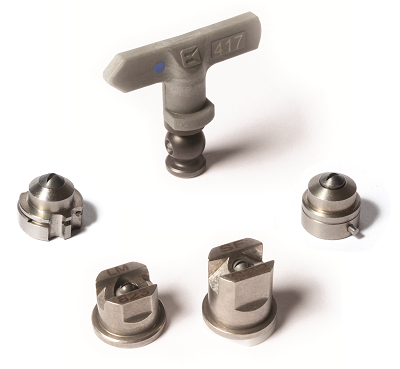 All of our high pressure nozzles are carefully manufactured, individually assembled and hand tested with water to ensure proper spray pattern and orifice size for optimal flow rate. Our sprayer tips are laser-marked for easy identification and can be found applying mastics, ceramics, buffing compounds, chemicals, stains, lacquers, latex, block fillers, oil based paints, and more. With our wide selection of applications and uses, our spray tips can already be found in the aerospace, agricultural, automotive, chemical, construction, electrical, marine, medical and surface treatment industries.